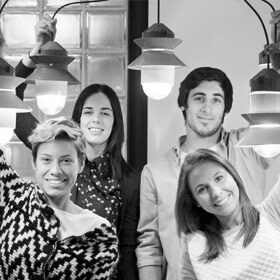 Sputnik is a multidisciplinary design studio based in Valencia, composed by Majo Fernández, Mari­a de la O Reyna, Maria Salar and Borja Sepulcre. It is born with a restlessness to create innovative and functional projects, providing to each design a different vision on everyday objects. In their projects there is an interaction with the user and a promotion towards the use of recycled materials, presenting forms that are bold and with character. The different trajectories of the four members allow them to perfect step by step each idea to finally converge in a simple yet beautiful design; with an innovative and positive character.